I'm pretty sure you guys are all talking behind my back telling each other to email me and ask what kind of heat transfer to put on Dri Fit. No? 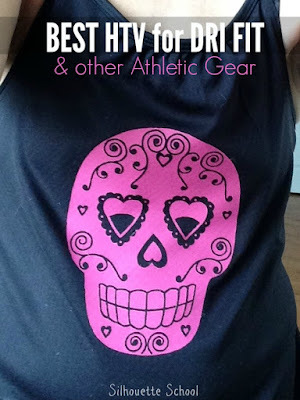 Well it feels like I've been getting a ton of questions about the best type of HTV for athletic apparel so I figured I'd just do a tutorial on it. You can certainly try the less expensive Siser Easyweed HTV, but I would really recommend you instead go for the Premium Heat Transfer vinyl from Expressions Vinyl. It has super stretchability, an ultra-matte finish and a soft, thin texture that almost melts into the fabric. There's no stiffness or bulk at all. I sacrificed one of my favorite (perfectly good) black workout tanks for this project. I even asked my 4 year old what design I should put on it and he said a skull. And so...you're welcome! The Premium fuchsia pink cut perfectly using the Smooth HTV cut settings in Silhouette Studio. Despite the detail in this design, it weeded very easily. The most difficult part about this whole project was trying to get the built-in sports bra out of the way and making sure the tank didn't wrinkle up (it's gathered at the neck) before I pressed on the design. I used my heat press at 310 degrees for 20 seconds and that's all it needed. An iron should work fine too. This shirt is loose fitting so there's not much stretch put on the heat transfer vinyl. However, I used the same vinyl on a ribbed tank, a workout headband (Premium white) and even put the HTV on a bathing suit and there's been no cracking or peeling! Could you please, point me in the right direction of where you got your skull? My daughter loves it and I would love to make her a shirt with that design. I looked in Silhouette School and didn't see that one, but I could have over looked it. I appreciate all you do and LOVEEEEE all your work and help you provide me! Thanks so much! In the Silhouette Store did you try typing "Sugar Skull" in the search bar? That's how I found the one I used tonight. Hi There - I am in Australia and the Expression shipping prices are a bit prohibitive. Could you advise if there are any qualities I should be looking for to transfer to dry fit? Seems to be good quality workout clothes. 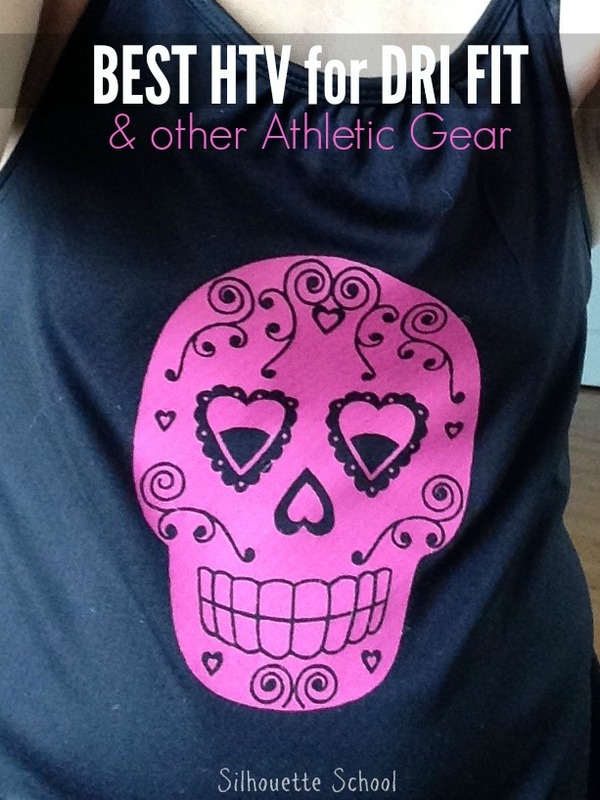 At first I wasn't real thrilled with these because they came up a little high over my hips, but after wearing them on the treadmill a few times, I became a fan BECAUSE the work out gear came high over my hips! Can you talk some about the temperatures more. Dri fits are labeled as do not iron. Any special precautions that should be taken not to melt your product? I am needing a glitter vinyl to put on polyester shirts. Does anyone have a suggestion? I'm not sure which HTV to purchase for a Dry Fit shirt. I clicked your suggested link, but it brought me to every type of HTV on the Expressions Vinyl site. Can you help?